Welcome to my FREE UPGRADE page. Since my books are in a constant state of improvement, you might like to stay up-to-date and make sure you have the current edition of The Eyre Affair. (Sadly, my Prose Portal is not functioning at present otherwise I could just go into the original manuscript of The Eyre Affair and do all this for you.) To upgrade to the new Version 1.4 edition all you have to do is follow the simple steps outlined below. All upgrades are copyright Jasper Fforde 2001. 1: Editions covered by this upgrade: All United Kingdom hardback and softback editions BEFORE edition 13, when books were upgraded at source. ON NO ACCOUNT attempt to upgrade any advanced publisher's proofs or US editions; a 'deep text crash' may result which will render your book unreadable and could wipe your entire library. 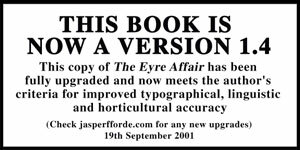 2: If your copy of The Eyre Affair has already been upgraded to V1.1, DO NOT WORRY. All you need do is skip items 6,8,9 and 15 below. If your copy has not been upgraded already, continue on below. 3: Earth the book by touching it lightly against a dictionary. 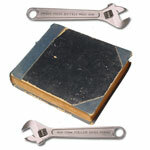 4: Disable any third party ancillaries such as bookmarks, pressed flowers, old bus tickets, etc. 6: Go to page 32 and replace 'Stella' with 'Steller's - this is the correct spelling. The large slow-moving-manatee-type-mermaid-legend creature was named by Georg Wilhelm Steller, the German naturalist. 7: Go to page 97 and replace 'Haben zie mein dodo gesehen' with 'Haben Sie meinen Dodo gesehen.' My thanks to H Schumacher for assisting me on this one. 9: Go to page 126 and where it says: 'A breeze, carrying with it the sweet scent of summer,' cross out 'scent of summer' and replace it with 'scent of spring'. As any botanist worth their salt will tell you, daffodils are a spring flower - not a summer one. I should have known this. 17: Go to page 307 and where it says: 'Brodyr Ulyanov' alter text to read: 'Y Brawd Ulyanov'. Adding the 'Y' here is a contextual thing. It means, simply, 'The brother Ulyanov'. 18: When you have finished the corrections reset the book by closing it and then turning it cover uppermost. 19: Congratulations! You are now the proud owner of The Eyre Affair V1.4. To fully authenticate your copy download the file 'upgrade1.4.jpg', print out the download, cut it out with scissors and affix it to the title page of your copy. Thank you for using the jasperfforde.com upgrade service. The Eyre Affair Version 1.1: Initial upgrade. Corrected typographical, linguistic and horticultural problems. The Eyre Affair Version 1.1.2: Small repair patch to stop chapters rearranging themselves alphabetically when the book is left in the sunlight. The Eyre Affair Version 1.3: Upgrade to Core Text Coding in the book. In a sudden increased 'G' manoeuvre it is possible to force an unconstrained translation of pages 67 to 98 into Esperanto. This has now been fixed. The Eyre Affair Version 1.3.2: Fixed the book against the very dangerous 'Colonic virus'. This virus can reduce the entire novel to a series of meaningless colons and can be spread from book to book by readers who turn down the page corners to mark their place instead of using a bookmark. This has now been fixed. The Eyre Affair Version 1.3.3: Further upgrade to core text coding in the book. This curious technical jiggerfoby in the Text Operating System can't differentiate between a definite article and a preposition. This should fix it but if it doesn't, then a manual text deletion may have to be attempted in the next upgrade. Also: Full stops have been fixed spherical as some of you noticed they had a slight 'ovalness'. We thank people who have jammed our switchboards over this one. The Eyre Affair Version 1.4: Latest upgrade. More linguistic, horticultural and typographical problems. Sadly, the V1.3.3 upgrade did not fix the definite article problem, so it will have to be done manually. Romeo & Juliet V1.3 upgrade: The messenger makes it in time; successful elopement, Montagues and Capulets keep on senselessly killing one another. Anthony & Cleopatra V5.6 upgrade: Mark Anthony gives up wide arch of ranged empire, marries Cleopatra, no asp, happily ever after. Sense & Sensibility V1.6 upgrade: Mrs Dashwood (nee Ferrers) crushed by wagon. John Dashwood agrees to let the girls stay at Norland Park. Tess V3.8 upgrade: Tess marries Angel in the first place; start dairy farm; lots of pretty children. Paradise Lost Book 1 V1.8 upgrade: God forgives Satan and agrees to coalition. Waiting for Godot V2.1 (Upgraded Title: 'Finding Godot') Godot is found. Complete and Utter History of the World Part sixty-eight V3.4 upgrade: Crimean war still on. Wales Socialist republic. Dodos available in home-cloning kits.